There was a time when almost every action movie seemed to involve the hero or villain becoming swamped in quicksand, sinking away until only their hat remains on the surface; even Flash Gordon and vine-swinging ape-man Tarzan were victims during their careers. But contrary to what Hollywood would have you believe, it's actually impossible to drown in quicksand, but almost as impossible to escape, as a Dutch scientist found when he produced his own home-made variety in the laboratory. Daniel Bonn was on holiday in the Iranian province of Qom when he saw a sign saying "Danger: Quicksand". Local shepherds had told him that, periodically, camels and people (usually those who had dared to disagree with the local regime) had disappeared in the area. Realising that science didn't actually have an answer to the quicksand conundrum, he took some samples home with him. So what is quicksand made of? Analysis of the composition of the "quicksand" showed that there are four key ingedients - sand, obviously, water, clay and salt. Together these materials form a structure resembling a house of cards, with large water-filled gaps between the sand particles, which are loosely glued in place by the clay. As long as it's left alone, the structure remains stable. But as soon as it's disturbed, by stepping on it, the clay changes from a jelly-like consistency to a runny liquid. The effect is the same as stirring a pot of yoghurt. Liquefying the clay makes the quicksand about one million times runnier, and the whole house of cards comes tumbling down, with you inside it. Very quickly, the sand sinks to the bottom and the water floats to the top. This is where the salt comes in. When there's enough salt present, as soon as the clay particles liquefy, electrical charges make them begin to stick together to form bigger particles and these also settle with the sand. Well certainly not the way Hollywood would have you do it - by being pulled out by a horse - because Daniel Bonn's measurements show that the force need to extract a trapped foot (ten thousand Newtons) is equivalent to that needed to lift the average family car. You'd probably escape, but minus your legs. The best way out is to try to re-build the house cards around the trapped body parts. Making small circles with each part of your body re-introduces water between the sand and clay particles, reducing the density and making it easier for someone to heave you out. But everyone apart from a Hollywood director can take solace from the most important finding of the research - that it's impossible to drown in quicksand - you should only sink half way. 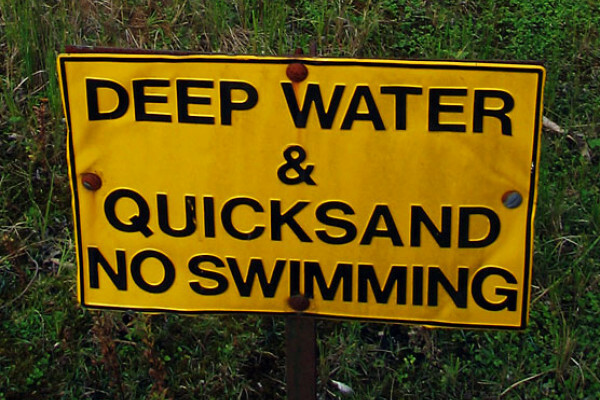 The density of quicksand, at 2 grams per cubic centimetre, is twice the density of a human (1 gram per cubic centimetre), so stuck you might be, but drowned you wouldn't! Next How do Thunderstorms and Lightning Work?